I’m a bit surprised by your first line. What’s the difference between calling something an incorrect answer and labeling it a mistake? My point of view is that it’s crucial in teaching to be straightforward and honest with myself and (especially) with students about when they are in error. And a lot of the time, error is straightforward. Being upfront about that simply does not make it harder to see interesting thinking behind those errors. I interrupted a debate that was growing heated and I said, wait, is this one of those times when there is clear right/wrong? Because it seems to me that this is one of those times when there are different assumptions and choices to be made. I did a bad job reading your piece when I wrote this, and I didn’t catch that you were very explicit about the distinction you were making between incorrect work and mistakes. I find that distinction sort of arbitrary, and the kids I know wouldn’t stress the difference between being told their work is incorrect vs. they made a mistake, but I definitely did a sloppy job reading your piece the first time. Now I get what you were going for. Whenever students offer their ideas, teachers need to a) recognize their students’ intent (vs. their own intent), b) help students develop their ideas further. You can probably call those ideas “garbage” and still work towards those mandates. But my sense is that language matters and “mistakes” undercuts both of them. But my sense is that language matters and “mistakes” undercuts both of them. I think the more radical constructivists and researchers who are also anti-mistake and anti-misconception would take issue with talk of “incorrectness” as well. You’re aiming for a middle position here that to me is not obviously tenable. If the labeling of something as a “mistake” is just a matter of saying the student didn’t conform to my expectations, the EXACT same thing could be said of labeling a student’s work as incorrect or in error. If your argument here was that “mistake” has a special connotation in the ears of students/people compared to other value judgements, I think that would be tenable. But the argument in the piece is too strong; it makes the case against labeling student thinking as incorrect at all. There is a difference between correctly doing what you intended where that is the wrong path to an answer because you haven’t fully understood, and following the correct path because you have understood but tripping up along the way. I think Dan is rightly and helpfully drawing that distinction, because recognising it in a student’s work is vital to how we help the student develop. Calling both “mistakes” hides that distinction. Calling both “mistakes” hides that distinction. I get that Dan is assigning “mistake” the meaning of “when you didn’t do what you intended to,” but did it have this meaning before Dan wrote his post? Is this a meaning that mistake has that error doesn’t? I’m just sort of confused where the language that fits this distinction is coming from. It just seems more straightforward to me to make a distinction explicit rather than burying it in terminology. And is the claim that this terminological distinction between mistake vs. correctness already exists in the minds of our students? That these shades of meaning are widespread? I don’t buy this. I feel like if it’s really important to make this distinction to teachers, just make the distinction: the student misinterpreted the problem, but correctly solved the problem they saw. If we call them the same thing, we think of them as being the same kind of thing. Language shapes and reflects our thinking. I dunno, Sean. There is no necessity here. There’s a difference between blue cars and red cars, but we get by with calling them both cars. Language might shape our thinking, but we don’t need a different word for every different type of student mistake. Assigning one side of a distinction to the word “mistake” seems to me like a choice, and an arbitrary one at that. We call both cars when we are happy to think about them as the same kind of thing. You can argue about whether “mistake” is the right word to do that with., but we should distinguish, and language is important in doing that. Just to clarify, I do see myself as questioning whether “mistake” is the right way to mark this in language. More generally, I think that coining (or redefining) a noun or a concept is a provocative but confusing way to mark these distinctions in language. Dan might have just said, “I think there’s a big difference between these two types of incorrect responses, and I think people sometimes mistake them.” But instead we get a new (I think it’s new) definition of mistake. Nobody cares, but I think this matters. There is the question on the page and the question inside your mind. Are you sure they are the same question? At some level, I think there’s still a mistake. It might just not be the mistake we think it is. Even if all the student wants to do is answer the question correctly, how can there not be a flaw in their thinking in this case? Maybe the mistake is “I can get full credit if I just find the pattern in the right column and ignore the left column” — which IS a mistake if what they intend to do is get full credit. I don’t know. It seems pretty clear to me that the student thinks you add 17 to get from one cell to the next. That’s what they meant to do and they did it correctly. I think I misunderstood the point you’re trying to make in the first place. I feel you’re making it poorly, but maybe that’s because I still misunderstand it. Nah! You’re correctly understanding the point of a post that I didn’t write. I just need to figure out what post you read so I can do a better job developing this post for you. Chris O. Have you ever thought about how subtraction can be “commutative”? As long as the negative sign remains in front of the number when the order is reversed, it is essentially becomes an addition problem. I haven’t come up with a good way to make division commutative. Kinda like thinking about how in Computer Science every cycle of the processor is an addition problem. Putting the negative sign in front of the number means you’re dealing with negative numbers (or, in the case of variables, opposite numbers). We can get rid of subtraction as an operation entirely if we’re willing to work with negatives and opposites. The only plausible way to do this with division is to write division as unit reciprocals (e.g., 4/5 = 4 * 1/5), which quickly gets more complicated than it’s worth. This is all subject to the definition of a mistake. If it is an error, than there is nk difference as being incorrect or making a mistake as they are synonymous. Both are guided in inaccuracies. If a teacher knows for sure that an error was made whilst still knowing the truth, then this line of reasoning is valid and one can deem it it a mistake. But how can one decipher? Maybe sometimes we cannot know which it is without asking some probing questions. But isn’t that our job: to try to understand our students currebf thinking in order to develop it further? Thanks for sharing here, Theresa. I think those are helpful messages that help cushion the negative connotation attached to “mistakes.” But my goal here is to stop seeing student ideas as “mistakes” entirely and instead see what question the student answered correctly, celebrate it, and build her understanding from there. If we teachers don’t see the logic as a mistake, how do we verbally trained to guide the student into the logical path? For example, if a student says 1+1= 3, what should I do as a teacher to help her improve her understanding. My current answer to the question is still back to your Math Surprise. Maybe give out several examples and let the students figure out the theorem and deeper the understanding. Going into the math surprise direction would be my long-term goal for these years. One approach: tell her how to directly count the answer. Another: figure out what question she was answering correctly and draw a connection from that question to the one you were asking. One of those approaches does much more justice to the student and her thinking than the other. “Students may not understand what they see, rather, they see what they understand.” Awesome Aaron. “… mathematics as a practice seems to be mainly in the service of economics and warfare. I am calling for a radical reimagination of mathematics, a version that embraces the body, emotions, and harmony. Amen. 10/10. Thank you Rochelle. There is a clear distinction between a “mistake” and what these students are doing (though I’m not sure what words to ascribe to the two). If, in Dan’s example, he mistypes “do” as “Do” (or as an earlier comment typed “nk” instead of “no”), then looking back over it, s/he is likely to say “Duh! I meant to type ‘do’ (or ‘no’).” This type of error is most likely due to carelessness, a slip of the finger/pen, overload (see Cognitive Load Theory) or similar. I would guess that for most students, 1+1=3 would fall into the same category. But with the original example, if a student looked at it again, would they go “duh!” or would they do (almost) exactly the same thing again? If “duh!”, then it’s a “mistake” and probably not worth spending time on it. But if they would do (almost) exactly the same thing again, then it’s a different category of error. Incidentally, I wonder what these students would do if there were gaps between the rows for n=3, 10 and 15, perhaps with dots or something, to flag up to the student that there is a jump in the number of marbles? Perhaps they simply ignored the left column. I think this is right. Actual mistakes are worth ~0% of the class’s time / energy / wall space for posters. Most incorrect errors are not mistakes. In your example, of COURSE what they’re doing is ignoring the left column and finding the pattern on the right. I don’t think teachers are really confused about that. At least, I hope not. If your point is that there’s a distinction between a momentary lapse, where a student writes something incorrectly* because they goofed and know better, and a different way of interpreting a task, where a student writes something incorrectly* because they have a different understanding of what the task is asking, okay. If your point is that we need words that distinguish between those, okay. But I don’t think most teachers are really confused about why a student would complete the table the way shown in the original post. If I’m still confused about your point, I hope you can clarify. Yeah, I think we’re reading the same post here, Paul. In the case of the table, I think lots of teachers can identify what the students are doing. It’s unclear to me how many of them would refer to that as a mistake (lack of intent) and try to overwrite it and how many of them would point out the sense the student was making (abundance of intent) and try to draw a connection between the problem they answered and the problem they asked. I confess I’m perplexed by the distinction you’re drawing, but let’s run with it – a difference between what I did and what I meant to do is a mistake. On one level, the example you give isn’t a *computational* mistake – the students meant to add 17 each time, and successfully did that. But it is a *comprehensional* mistake – (presumably?) the students meant to read the whole of the modeling scenario and respond to it in a consistent way. They haven’t done that, so they’ve made a mistake in their reading and modeling. I think that one of your most compelling ideas is that a reductive definition of mathematics that includes only computation destroys students (and adults) love of genuine mathematics. We ought to include reading, comprehension, and modeling in our picture of what constitutes mathematics. Through that lens, your example is definitely a modeling mistake (they meant to incorporate the left column, and didn’t do so fully). But your argument that there’s no mistake here seems to reduce the sphere of mathematical intent to computation, contrary to that. So I’m perplexed. Good comment! I like your point about narrow vs. expansive definitions of math in relation to this post. Perhaps “misconception” is the word we’re looking for? In their mind, based on their conceptual understanding, what they did makes sense. These “windows” as Dan calls them allow for us to see what conceptual underpinnings are missing or misaligned. I’ve had a lot of these moments where I come to find out, the student was just thinking outside the box and actually had no misconceptions, it was just a more open question than I realized. @thaslam “misconceptions” is a term that, like “mistakes,” focuses our view on everything the student doesn’t know, rather than what they do know. I’m excited to pick this article back up shortly. If you read it, let us know what you think. @Dan – Perhaps it’s cleaner to say that most incorrect answers involve at least one mistake. Certainly there are distinctions among mistakes — as I suggested. There are mistakes of computation, mistakes of understanding, mistakes of modeling, mistakes of transcription, and mistakes of strategy. And certainly a teacher should deal with each differently. So I don’t know that acknowledging that there are mistakes of comprehension or modeling erases the distinction your aim at. I carefully didn’t say the student intent was “intending to answer the question correctly”, which I agree would elide over important distinctions. I purposefully wrote that the student intent was to “read the whole modeling scenario” — something that absolutely has to be taught. It’s not obvious to me that students working that problem even realize that there *is* a left column, much less that the left column *matters*. Have you read Polya’s “How to Solve It”? It’s far and away the best text I’ve encountered about how to teach both students and oneself to fix modeling and comprehensional mistakes. @Dan, Your right. I don’t think English has a word that has the right connotation–which might be why this idea is so foreign to so many math teachers. “Shortcoming”, “learning-gap”, “unfinished”, “evolving” …they all have a connotation of “you’re not here (where I am) yet” instead of the “show me where you’re at/what your thinking” mentality. I love this and it makes me ask more questions. I encourage my students to discuss what mistakes they made (on homework especially). What language would be better? I have teeny tiny stickers I hand out to get the ball rolling, but once they hear that everyone else did the same things wrong that they did they are so eager to share and it leads to great convos as a class. I also often say “that’s the right answer to the wrong question!” when they are applying a rule or process to the wrong situation and I find this really deescalates their frustration. Yeah, I like this a lot. Something I’m more and more convinced of, though, is that the correctness of answers to individual questions does not matter, except in the most summative of circumstances. We can learn lots from incorrect answers! So I’d rather tell students, “That’s the right answer to a different question,” then tell them the question they answered correctly, and ask them how that’d change their original answer. Looking at that table, I want to say “Together you and I have made an incorrect statement. What can *we* do to fix it?” Because the incorrect row was written by both the teacher and the student, this is failure of communication and coordination and those are never on one person. The teacher has responsibility to acknowledge that they could have communicated more clearly as well, perhaps by putting a “…” row to indicate the jump in the table. I’m glad we got to talk about this at OAME the other week – it helped me better understand your point of view. Love the window and mirror analogy. How do we get better at listening to what students are thinking? It seems like semantics but you’re really making me think about the unintended message our students hear from us as we more regularly use the word mistake. Those were predictable errors the student made. She gave the right answer to a different question. How do we get students to slow down and notice the data in the chart? That way we would find out if they understood this concept. I currently see that the student can extend a pattern but I don’t yet know if she sees the relationship multiplicatively. So I need to just ask a different question to find out if she knows. I don’t want to worry about if it’s a mistake or error or … I just want to find out what she currently understands. If your goal, as a teacher, is to have students find the “right answer,” then you could argue that a mistake is the difference between the student’s answer and the teacher’s answer. But if the teacher’s goal is to figure out what the student is thinking, then the most important is to probe the student’s thinking. So rather than communicate to the student that he/she has made a mistake, I could see myself put my hand over the left column of the table, and ask, “so 677 ml is for how many marbles?” and then ask that student to explain how he/she came to that number of 677 ml, with a couple of “why” follow-up questions. As we ask our students to develop their thinking about a certain concept, our goals with the students evolve from exploring to applying. There will be times when I only want to probe their thinking, and times when I want to disagree with their solutions. I do agree with what is written, but I still wondering what I’m supposed to do with that information and the student’s copy. This reminds me of Max Ray-Riek’s “2 > 4” Ignite! talk. To call the table entries a mistake is an example of listening for the answer instead of listening to the student. I think you need to look at the table and ask yourself “What does this student appear to understand?” and “What do they appear NOT to understand?” I think you could make a reasonable argument that they understand the larger concept, but simply didn’t watch the left side of the table close enough. It’s possible that it is an incomplete understanding of the concept, but they do spot a pattern. I can think of several questions I would ask based on the information in the table and how they completed it. None of that would involve the word “mistake.” It’s not a “mistake.” It is their own mathematical thought that warrants further discussion. Yeah, great call. Max’s talk is on the shortlist of inspirations for my thinking here. I’ll post the rest later. The hard part is that there isn’t really a single answer. I think that it’s important for teachers to have a range of words that they can use carefully and precisely (incorrect, error, misconception, overgeneralization…). I think it’s worth teaching students these words. It’s a good way to talk about metacognition, and I like making my teaching transparent. (“I’m asking you these questions because I’m not sure if you have a misconception about tables or if you just made a mistake because you weren’t paying close attention.”) I want this to be a conversation starter. I don’t think my attitude about mistakes/errors/etc. is something that I want to sum up in a catchphrase or rhyme. If I just say, “mistakes are proof that you are trying,” where does that leave the student? What can the student possibly do in response to that besides erase everything and start again? Clearly, the goal here is for the student to just keep trying, as if that will magically clear things up. (If at first you don’t succeed, try, try again. Even if you have no idea why you didn’t first succeed. And even if you just keep trying the same thing. Just look like you’re working so that I don’t have to worry about you.) According to the poster, if you don’t make mistakes, what does that prove about you? That life is effortless? That you didn’t really try, you just knew the answer? If we go with Dan’s definition of mistake, then it’s very likely that a mistake is actually proof that you were just being sloppy, i.e. : not trying very hard. And work without mistakes is actually the only work that is reflective of what you think and know, which is the point where we can begin to talk about whether you understand the concept. Before you hang something in your classroom, think about what it says to the discouraged, the cynical, and the disaffected. They’re the ones who will be zoning out by staring at the walls in the first place. Asking a student to verbally explain their thinking on a problem like this would be a better indicator of their understanding. Some students would probably realize that their answer was incorrect when they tried to explain it. Or, if they had just memorized a procedure without understanding, their written work would expose that. I agree. The biggest factor behind errors on questions like this is the unintuitive formatting of the task and a failure to provide students with an opportunity to show/explain their thinking. A teacher above mentioned that there’s sometimes a difference between “the question on the page” and “the question in your mind”, but how many students are actually going to do the metacognitive work of matching these two things up when faced with such a straightforward looking math task where the question is, ostensibly, explicitly stated. I think this is also what’s at the root of Dan’s distinction between errors and mistakes. The reason it’s not a “mistake” is that someone can intuitively take a look at a problem like this, come up with a plan of action, and carry out it, all without realizing that the last two numbers in the left column are 10 and 15. Whenever I hear a student offer more than one or two sentences of explanation about mathematics, I find it so hard to call it a mistake or even incorrect. It’s always a mix of ideas in different levels of formation. We can skip the labels entirely and move on to developing questions and commentary. I find the four types of mistakes described in this article https://www.kqed.org/mindshift/42874/why-understanding-these-four-types-of-mistakes-can-help-us-learn I think part of our job is teachers is to help students understand that all mistakes are not created equal and to think about the types of mistakes they are making. As a classroom teacher, I had my students analyze the errors they made on their assessments and decide if they were Careless, Reading, or Knowledge errors. The first time through I explained that I really couldn’t help them with their careless or reading errors – that was something they had to do on their own during the quiz/test by reading the directions & problems carefully and checking their work. Knowledge errors I could help with. Students are the only ones who can tell us what kind of mistake it is. Understanding these types of mistakes is also helpful for educators to consider when analyzing assessment data and considering the types of re-engagement students might need with a concept. This was an illuminating article and thanks for the share Jennifer. I like the error categories you provided for self assessment. Do you describe this method in more detail anywhere? I’d love to share with other teachers. If not, I will save this comment. I teach all high school math, including statistics. In statistics we really stress the importance of clearly communicating to your audience, especially when using graphics. In this case, the teacher is trying to communicate a linear relationship between the number of marbles and the water level. 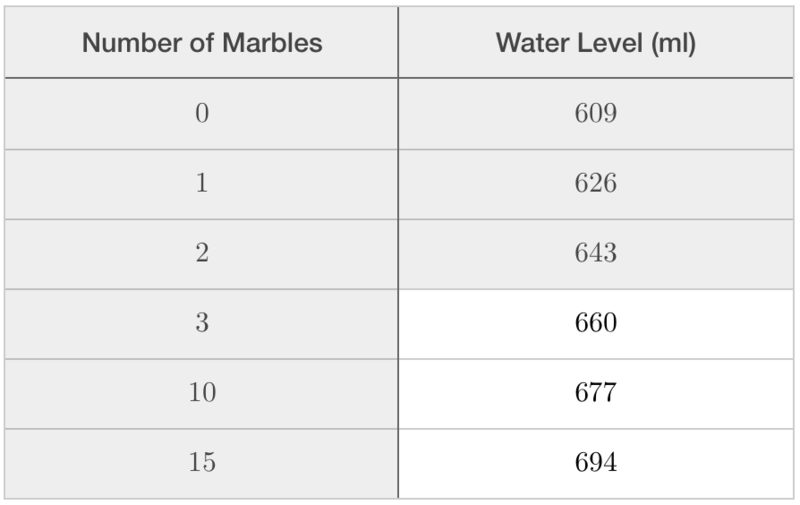 It would be more clear if the table had three vertical dots indicating that the marble amounts jumped to something other than the next consecutive number. If this device was the seed, I think many more students would have answered this question correctly. I agree with Frank Murphy and Julian Gilbey that starting with consecutive numbers of marbles and then skipping to higher numbers further down the table would be more noticeable with dots or some other indicator. There is a “gotcha” nature to this task, unless the primary focus is around multiple representations of functions and not so much around linear patterns. One question I always ask of myself is “Who owns this mistake?” If many students missed the relationship between the independent variable and the dependent variable, then the mistake is mine and not the students’. I need to own that mistake, and frame the problem better in order to facilitate the students making sense of the mathematical relationship between cause and effect. How was this problem presented and framed for the students? I think a lot of comments here are missing the point. We are not splitting hairs trying to categorize student errors. We are separating faux pas from learning opportunities. And it’s not what you call them that matters, but how you communicate with students through that learning opportunity *will* impact their math identity for better or worse. We can still help them through the concept without doing something that reinforces the “I stuck at math” mentality. Also, I’m curious, is the 3 marble entry right or wrong? After reading Dan’s reply to an earlier comment, apparently I still missed a crucial point: value what the student does know! I think it’s even better to incorporate your ideas above, Dan. So you’d say “After this step, you recognized that it’s growing by 17. So since 3 marbles gives a water height of 660 mL, you know that the next water height will be 677 mL. The next thing to do is to realize that the number of marbles didn’t just increase by 1 here. How many marbles got added? Your next step is to use the adding by 17 idea and also notice how many marbles are getting added. Fred Jones rocked my world as a second-year teacher omg. The next thing to do is to realize that the number of marbles didn’t just increase by 1 here. I’m wondering how different this is from “Here’s a question you answered correctly,” and actually scribbling new numbers 4, 5, and 6, over the table. Let’s consider: If f(x) = 2x^2, evaluate f(-2). Student 1: 2(-2)^2 = 2(4) = 6. About the last step, they say that 2 times 4 is 6… oops, I mean 8. They know what 2 times 4 is, but they had a temporary lapse. Student 3: (2*-2)^2 = (-4)^2 = 16. They have a misunderstanding about the conventional order of operations. Student 4: 2(-2)^2 = 2(-4) = -2. There are two misunderstandings here, one of which, it turns out, is caused by the calculator: They put -2^2 in the calculator and got -4. Then they had the same misunderstanding as student 2. Student 5: 2(-2)^2 = 2(-4) = -8. This student did the same thing with the calculator as student 4, but did the multiplication correct. Student 6: (2*-2)^2 = -4^2 = -16. I guess my question is… If I’m understanding you correctly, only student 1 is making what you’d call a mistake, the rest have various misunderstandings… but what do we call these, if not mistakes? And I feel like 2(4) = 6 (student 2’s reason), (-2)^2 = -4 (the calculator says so for -2^2), and student 3’s thinking are different types of misunderstandings. Is it your intent to lump them all together but separate them from student 1’s error? I am curious – what did the students say about why they completed the table in this manner? Similar to other posts, I think I would have said something along the lines of “You gave me the correct water level for 4 and 5 marbles, but I was asking for the water level for 10 and 15 marbles. How would you go about finding that?” I might say that for the whole class since so many answered incorrectly, but individually I think I would inquire about what they may not have understood about the question. Yeah, what you’re doing here is letting the student know, on an affective level, that you see what they’re trying to do, their intent and agency. That seems big to me in math classes where students are often subject to what in my view is pretty dehumanizing pedagogy. You’re also creating a connection, cognitively, between existing knowledge and new knowledge, which is very different than going to the board and saying, “I’m seeing lots of mistakes right now. Let me offer you folks a general method for answering questions like these.” Big fan. 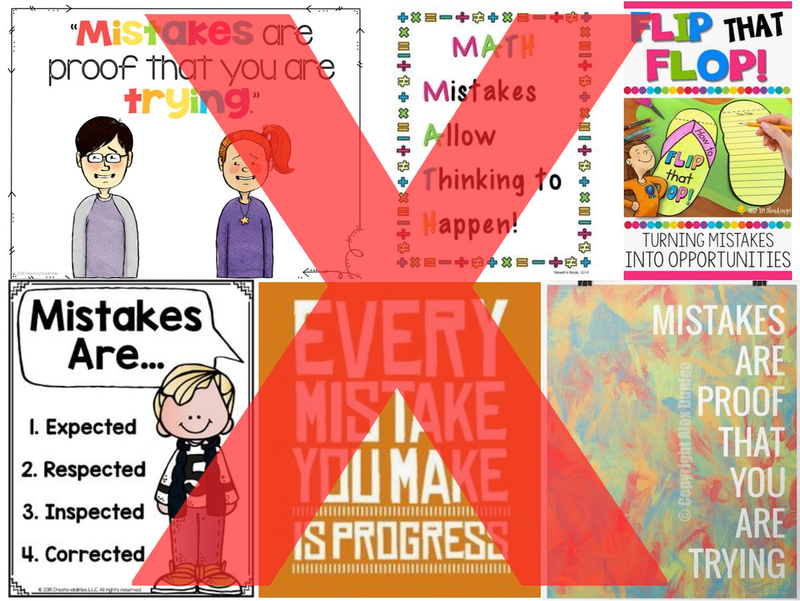 I love the pushback you are giving STEM educators (including myself) around the positive spin that has been created around “mistakes.” As I’ve said elsewhere, I believe that this fail-forward attitude is a reaction to the math anxiety teachers feel from their students. It is an attempt by educators to create a safe space where it is “ok to be incorrect.” Additionally, the word “mistake” has been coopted to replace “wrong answer”, whereas the usual definition is to indicate a small oversight. The more I read this debate, the more I agree with you. By calling incorrect responses mistakes, we reinforce the mental model we are trying to deconstruct. We want our kids reasoning and sense-making. We need shared vulnerability. A climate where my thinking is thought of as a mistake doesn’t seem very welcoming. I started using the catchphrase, “Celebrate Mistakes” back in 2013… but I didn’t mean it literally. Perhaps I didn’t know what I really meant. It was catchy. Your statement is a much better articulation of what I was trying to convey. Celebrate the opportunity to connect with another human when they follow a path of reasoning that is different from your own. I really appreciate the connection you’re drawing between this post and the recent push to destigmatize mistakes. I also agree that thinking about (or not thinking about) mistakes in the way that Dan is advocating for, is a better solution. The word mistake will always have a stigma attached to it, regardless of how much we tell our students to see mistakes as learning opportunities. Actually taking the time to describe students’ sense-making in a positive way in lieu of labeling it “mistake” is a more authentic approach to validating students’ thinking (even when it’s not the answer we wanted/expected). Thanks for your re-articulation, Evan. And agh! I forgot I wrote this post already! I think the issue is the judgement attached to the word “mistake.” The response given demonstrates a level of understanding on the student’s part. To write it off as a mistake feels like the conversation is over when I would argue that the conversation is really just beginning. If you are listening for answers and view their answer as the end of the conversation then it’s easy to write it off and move on. If you view the question as an invitation for the student to share their thinking then it is only the beginning. They clearly understand some important ideas here yet their is room for better understanding through conversation. It just feels like, to me, that calling it a mistake closes a door when, in fact, it opens one. Yes, Scott! This conversation Is making me think of the book “Impact of Identity.” The way students view themselves as thinkers/doers of mathematics is important in their development. The article, “Are they wrong? Or did they just answer a different question?” from TCM (November 2005, Vol. 12, Issue 4) is a great way to help us reorient our approach to unexpected answers. b) a learning environment which is not for test only, but also learning for the sake of learning not testing etc. I’ve always found very hard to leverage the power of mistakes in a test-oriented school or classroom etc. Ain’t that the truth! I feel like a of of my energy gets spent on trying to “ignore” that test-oriented culture that is far to prevalent in our district and feeder schools. Healthy attitudes towards assessment are just as important as healthy attitudes towards “mistakes”. I love the line in Principles to Actions that says, “support the learning of important mathematics and furnish useful information to both teachers and students” and that it should motivate, support, and improve math learning. I really like this idea and I think that it could really help students mindset about math. I wonder how you would handle a situation where it seems the students understood the pattern and attempted to add 17 all 6 times but did not manage to come up with the right value. If they had the right idea but messed up on the math would you still frame it as not being a mistake? Or is it okay in this case to say you did a great job of understanding and you recognized what I wanted you to recognize but you simply made a calculation error? I feel that this is a great thing to think about when looking at and responding to student work. It will feel like more work and might be more difficult on the teachers part, but it should have a valuable impact. Or is it okay in this case to say you did a great job of understanding and you recognized what I wanted you to recognize but you simply made a calculation error? Right. If I’m confident that students didn’t do what they meant to do, I don’t have a problem making that observation, telling them that their intent makes a lot of sense to me, that they just need to make sure they enacted it correctly. Every hay fever sufferer could have slightly different symptoms in addition to their allergies will likely be equally as individual. recipes, to presenting it as being relief for any sore throat. [Mailbag] What Do You Do with the Ideas You Used to Call “Mistakes”	Big Online Courses Have a Problem. Here’s How We Tried to Fix It.